Cold Weather Painting Tips: When Is It Too Cold to Paint Your House? With the winter season looming, you may be wondering if you should paint the interior or exterior of your house when temperatures drop. While paint reacts differently in cold weather compared to how it performs during warmer months, winter days can still provide plenty of opportunity to finish your house painting projects. But, when is it too cold to paint your house? The following information will help you determine when it is too cold to paint indoors, outdoors and the precautions to take when painting in cold weather. When is It Too Cold to Paint Outside? Most labels on exterior paint cans used to warn homeowners that they shouldn’t paint in temperatures below 35 degrees. House paint has come a long way in recent years thanks to modern advancements in paint materials. Most paint manufacturers now offer acrylic latex paints that can be applied to your house exterior in temperatures as low as these 35 degree marks. Professional painters should always be sure to paint in consistent temperatures to ensure the paint cures properly. Even if it is chilly in the morning, preparation work can be done in cooler temps (e.g. taping/tarping, scraping, priming, caulking and sealing, wood repair and replacement, setting up equipment, etc.) before the air warms up. While painting your home exterior in cold weather can be done, it’s important to be certain that the house paint you choose states on the can that it can be used in cold temperatures. Be sure you book your exterior painting project when you have ample time to allow each coat of paint to dry. This will depend on temperature, humidity, sunlight and other environmental factors If your home needs more than one coat of paint, you may need to allow the first coat to dry for up to a day before the second coat is applied. Paint dries by chemical reaction to air. Contrary to what many homeowners think, it does not need sunlight to “bake” it dry. Therefore, there is flexibility in painting exteriors in the right temperatures during the colder seasons. For smaller painting areas, tarps can be set up with heaters to create a warm enclosed space. Even a hair dryer can be used on doors or windows to speed the dry time before closing them for the evening. The best painters who work year-round have the right tools and equipment to paint when Mother Nature brings cold winter temperatures. Some days, it’s just too cold to paint. A professional painter will simply wait until a warmer day arrives to get back to painting your home. 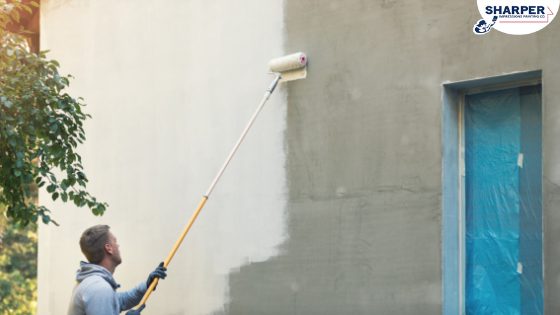 Make sure your painting company has a written warranty and has been offering painting services for many years to ensure that your paint job is protected for the long haul. When is It Too Cold to Paint Inside? If you’re looking into interior painting for the holidays, or want to paint your home interior prior to putting your house on the market this spring, just know that winter is the perfect time to paint interior walls and trim as long as the room and surfaces you’re painting are 50 degrees or warmer. If your living space and surfaces can offer some type of warmth, you are good to go. Space heaters are great for painting a home without an operating furnace. Painting companies are also typically more open during the slow winter season which can help them complete your project sooner and work around your busy holiday schedule. You can also save money on your painting project due to the slower winter season. Painting your house in cold weather is possible with a solid plan, the right painting supplies and great professional house painters in your corner. While there are plenty of new painting products that can be used in cold temperatures, it’s important to leave your interior or exterior house painting projects to professionals who know exactly which paints and tools to use for producing long-lasting paint jobs. Get your free house painting quote today! Home » Recent Projects » Cold Weather Painting Tips: When Is It Too Cold to Paint Your House?